The World Health Organization has urged countries to strengthen their flu control as another influenza pandemic is ‘inevitable’. The WHO has launched a global strategy in hope of reducing the impact seasonal outbreaks have. Alongside a raft of measures, it said a bigger uptake of flu vaccines is vital because the cost of treating flu is far greater. The WHO described influenza as one of the biggest public health challenges and experts have said it is a larger threat than terrorism or cyber-attacks. ‘The question is not if we will have another pandemic, but when,’ said WHO Director-General Dr Tedros Adhanom Ghebreyesus. ‘The threat of pandemic influenza is ever-present. We must be vigilant and prepared – the cost of a major influenza outbreak will far outweigh the price of prevention’. Influenza epidemics affect around one billion people and kill hundreds of thousands annually, according to WHO. The estimated toll of up to 50 million deaths in the Spanish Flu pandemic of 1918 exceeded that of the First World War. Subsequent pandemics have killed millions globally, occurring in 1957–1958, 1968–1969 and 2009–2010. The most recent flu pandemic infected an estimated one in five people worldwide and killed between 100,000 to 400,000 people. Fears of a flu pandemic have mounted following the worst outbreak in recent years that rocked the UK, Australia and the US in 2017-2018. The rocketing number of flu cases in the UK and across the world was put down to a surge in four aggressive subtypes that attacked the population simultaneously. 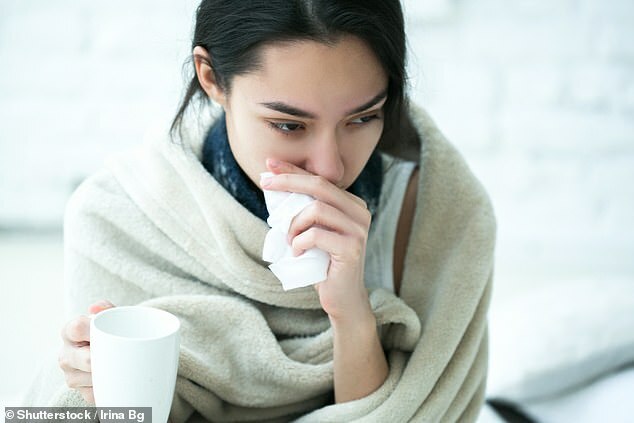 One included the so-called ‘Aussie flu’, a strain of influenza A which triggered triple the number of expected cases in Australia during the country’s winter. Experts feared the virulent H3N2 strain, which reached the UK, could prove as deadly to humanity as the Hong Kong flu in 1968, which killed one million people. Another was a strain of influenza B, called Yamagata and dubbed ‘Japanese flu’, which was blamed for the majority of cases during the UK’s winter. Its rapid spread raised concerns because it was not covered in a vaccine given to the elderly. However, experts claim it was less severe. Usually, just one subtype, of either influenza A or B, is responsible for the majority of cases. The bug spreads easily in the cold weather. There has been significant progress since the first pandemic, including the development of influenza vaccines, antiviral drugs and better diagnostics. Vaccines are recommended as the best protection – although they aren’t 100 per cent effective, especially for the most vulnerable people. ‘The cost of a major influenza outbreak will far outweigh the price of prevention,’ Dr Tedros said. Preparations for an epidemic is estimated to cost less than $1 (76p) per person per year, but responding to a pandemic costs roughly 100 times that amount, the WHO said. The WHO warned that despite significant medical advances over the past 100 years, there will still be populations that have limited access to care and would be ‘likely to experience high mortality rates during a pandemic’. The strategy for 2019-2030 has two main goals based on the most urgent challenges. The first is to improve worldwide capacities for surveillance and response – the WHO has urged all governments to develop a national flu plan. The second is to develop better tools to prevent, detect, control and treat influenza, such as more effective vaccines, antivirals and treatments, with the goal of making these accessible for all countries. The influenza virus is constantly changing, with multiple strains, and within them multiple types which keep mutating. This makes it difficult for scientists to develop an effective vaccine ahead of the flu season. Last year’s final figures for the whole 2017/18 flu season showed the vaccine was just 15 per cent effective across all age groups. For the latest flu season, a new ‘booster’ vaccine was brought in to improve the effectiveness among the over-65s. ‘With the partnerships and country-specific work we have been doing over the years, the world is better prepared than ever before for the next big outbreak, but we are still not prepared enough,’ said Dr Tedros. The 1918 flu pandemic was unusually deadly and the first of two involving the H1N1 influenza virus. It infected 500 million people globally, more than one-third of the world’s population, including people on remote Pacific islands and in the Arctic. It resulted in the deaths of an estimated three to five per cent of the world’s population, making it one of the deadliest natural disasters in human history. Within months it had killed three times as many as World War I and did it more quickly than any other illness in recorded history. Most influenza outbreaks disproportionately kill juvenile, elderly, or already weakened patients. By contrast, the 1918 pandemic predominantly killed previously healthy young adults. To maintain morale, wartime censors minimised early reports of illness and mortality in Germany, Britain, France, and the United States. However, newspapers were free to report the epidemic’s effects in Spain. This created a false impression of Spain as being especially hard hit, leading to the pandemic’s nickname Spanish flu. 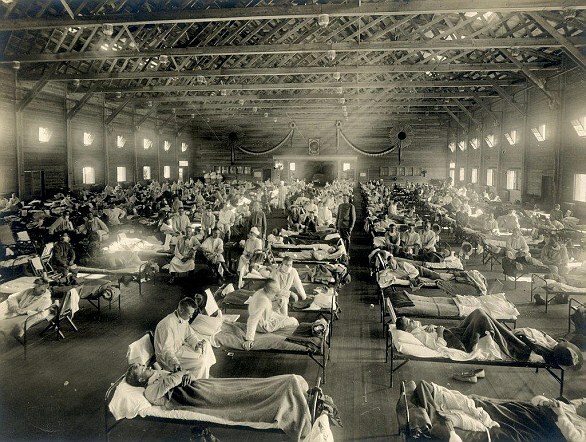 The close quarters and massive troop movements of World War I hastened the pandemic and probably both increased transmission and augmented mutation, researchers believe. The true global mortality rate from the pandemic is not known, but an estimated 10 per cent to 20 per cent of those who were infected died. This would lead to a death toll of between 50 to 100 million people.